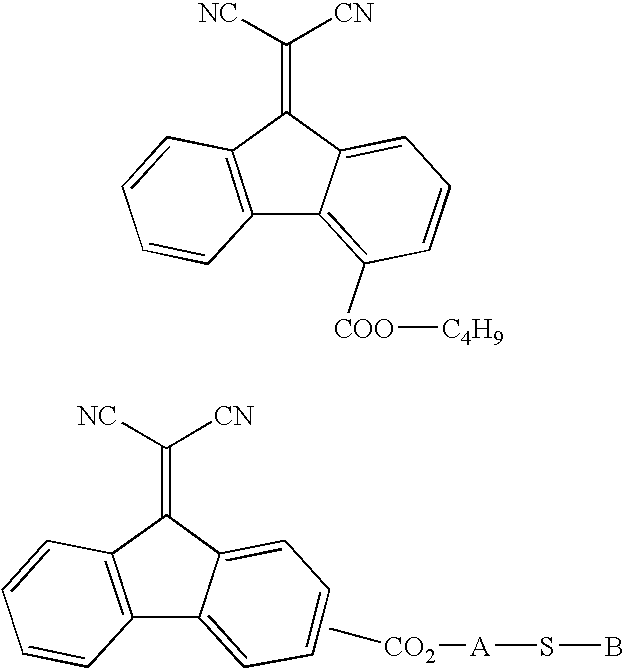 A photoconductive imaging member containers of a supporting substrate, and thereover a single layer comprised of a mixture of a photogenerator component, a charge transport component, an electron transport component, and a polymer binder, and wherein the photogenerating component is a pigment. U.S. Pat. No. 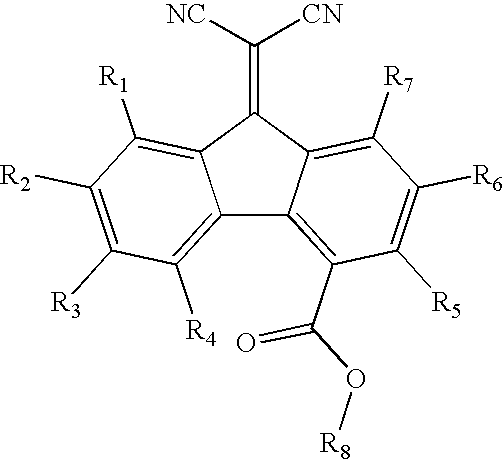 6,268,096 discloses a titanyl phthalocyanine crystal, a photo conductive material comprising the same, and an electrophotographic photoreceptor using the same. In particular, the titanyl phthalocyanine crystal comprises a primary particle diameter ranging from about 0.03 to about 0.15 μm, showing a maximum X-ray diffraction peak at a Bragg angle (20±0.2°) of 27.3°, having an ellipsoidal tabular form, and having a BET specific surface area of not less than 35 m 2/g. Table 1. TiOPC(IV)-based single layer devices. 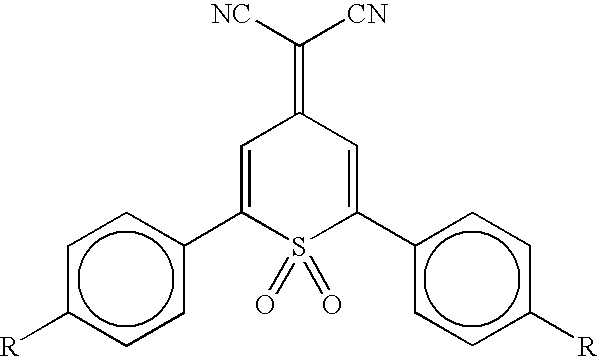 Solvent: THF:MCB (88:12). Solid content: 23.4%. Comparative results of single-layer devices based on other pigments are also shown (Note: different solvent systems may be used). 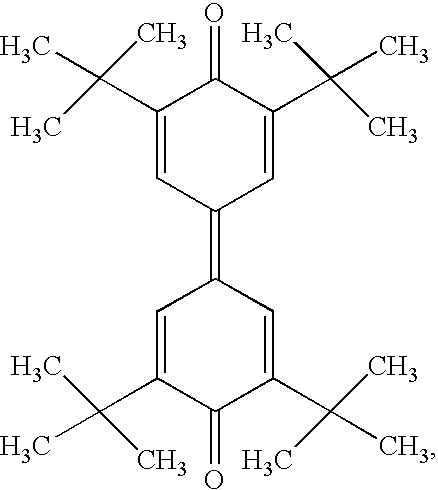 TPD: N,N′-diphenyl-N,N′-bis(methylphenyl)-1,1-biphenyl-4,4′-diamine. 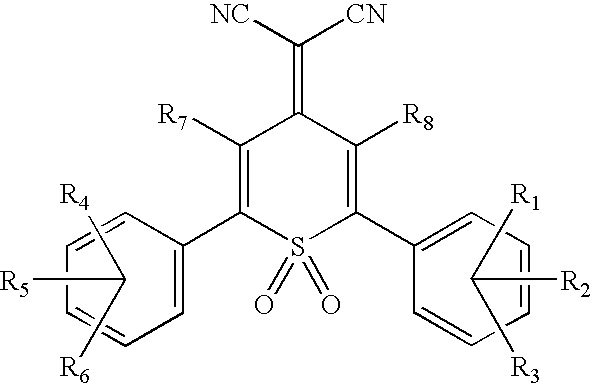 NTDI: N,N′-bis(1,2-dimethylpropyl)-1,4,5,8-naphthalenetetracarboxylic diimide. L/ε: dielectric thickness. V 0: initial surface potential. dV/dX: slope of the PIDC of initial surface potential versus exposure energy. Vdepletion: voltage depletion of an imaging member. VR: residual voltage. 1. A photoconductive imaging member comprised of a supporting substrate, and thereover a single layer comprised of a mixture of a photogenerating component, a charge transport component, an electron transport component, and a polymer binder, and wherein the photogenerating component is comprised of titanyl phthalocyanine and hydroxygallium phthalocyanine. 2. An imaging member in accordance with claim 1 wherein said single layer is of a thickness is from about 5 to about 60 microns. 3. An imaging member in accordance with claim 1 wherein the thickness of said single layer is from about 3 to about 50 microns. 4. An imaging member in accordance with claim 1 wherein the amounts for each of said components in said single layer is from about 0.05 weight percent to about 30 weight percent for the photogenerating component, from about 10 weight percent to about 75 weight percent for the charge transport component, and from about 10 weight percent to about 75 weight percent for the electron transport component, and wherein the total of said components is about 100 percent, and wherein said layer components are optionally dispersed in from about 10 weight percent to about 75 weight percent of said polymer binder, and wherein said layer is of a thickness of from about 5 to about 15 microns. 5. An imaging member in accordance with claim 1 wherein the amounts for each of said components in the single layer is from about 0.5 weight percent to about 5 weight percent for the photogenerating component; from about 30 weight percent to about 50 weight percent for the charge transport component; and from about 5 weight percent to about 35 weight percent for the electron transport component; and which components are contained in from about 30 weight percent to about 50 weight percent of a polymer binder. 6. An imaging member in accordance with claim 1 wherein said single layer components are dispersed in said polymer binder, and wherein said charge transport is comprised of hole transport molecules. 7. An imaging member in accordance with claim 6 wherein the binder is selected from the group consisting of polyesters, polyvinyl butyrals, polycarbonates, polystyrene-b-polyvinyl pyridine, and polyvinyl. 8. An imaging member in accordance with claim 6 wherein said binder is present in an amount of from about 50 to about 90 percent by weight, and wherein the total of all components of said photogenerating component, said charge transport component, said binder, and said electron transport component is about 100 percent. 9. An imaging member in accordance with claim 1 wherein said photogenerating component absorbs light of a wavelength of from about 370 to about 950 nanometers. 10. An imaging member in accordance with claim 1 wherein the supporting substrate is comprised of a conductive substrate comprised of a metal. 11. An imaging member in accordance with claim 9 wherein the conductive substrate is aluminum, aluminized polyethylene terephthalate or titanized polyethylene terephthalate. 12. 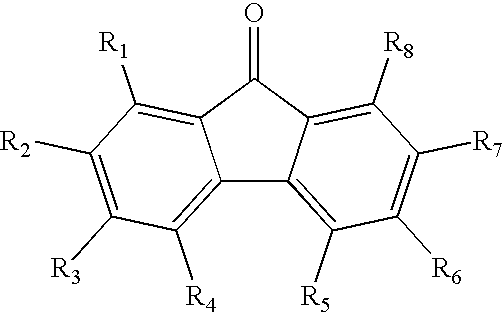 A member according to claim 1 wherein the titanylphthalocyanine is prepared as a dispersant of poly (4,4′-diphenyl-1,1′-cyclohexane carbonate(bisphenol-Z polycarbonate) in an organic solvent. 13. 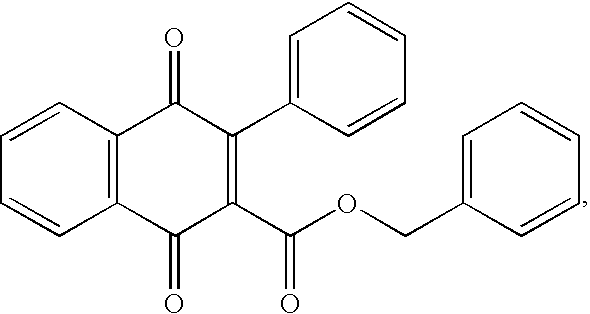 A member according to claim 1 wherein the titanylphthalocyanine is prepared as a dispersant of bisphenol-A polycarbonate in toluene. 14. 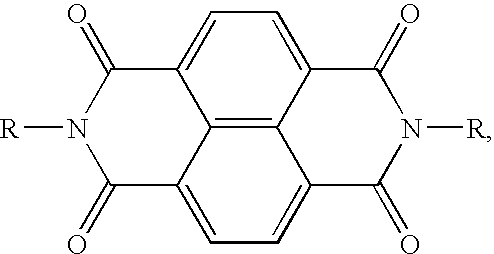 A member according to claim 1 wherein the titanylphthalocyanine is prepared as a dispersant of 2,2-bis(4,-hydryoxyphenyl)propane (bisphenol-A polycarbonate in xylene). wherein X is selected from the group consisting of alkyl and halogen. 16. An imaging member in accordance with claim 15 wherein alkyl contains from about 1 to about 10 carbon atoms, and wherein the charge transport is an aryl amine encompassed by said formula and which amine is optionally dispersed in a resinous binder. 17. An imaging member in accordance with claim 15 wherein said charge transport is comprised of molecules of N,N′-diphenyl-N,N-bis(3-methyl phenyl)-1,1′-biphenyl-4,4′-diamine. 18. An imaging member in accordance with claim 1 wherein said electron transport component is (4-n-butoxycarbonyl-9-fluorenylidene)malononitrile, 2-methylthioethyl 9-dicyanomethylenefluorene-4-carboxylate, 2-(3-thienyl)ethyl 9-dicyanomethylene fluorene-4-carboxylate, 2-phenylthioethyl 9-dicyanomethylenefluorene-4-carboxylate, 11,11,12,12-tetracyano anthraquinodimethane or 1,3-dimethyl-10-(dicyanomethylene)-anthrone, N,N′bis(1,2-dimethylpropyl)-1,4,5,8-naphthalenetetracarboxylic diimide, 1,1′-dioxo-2-(4-methylphenyl)-6-phenyl-4-(dicayanomethylidene)thiopyran, butoxy carbonyl fluorenylidene malononitrile, a quinone selected from the group consisting of carboxybenzylnaphthaquinone and tetra (t-butyl) diphenoquinone. 19. 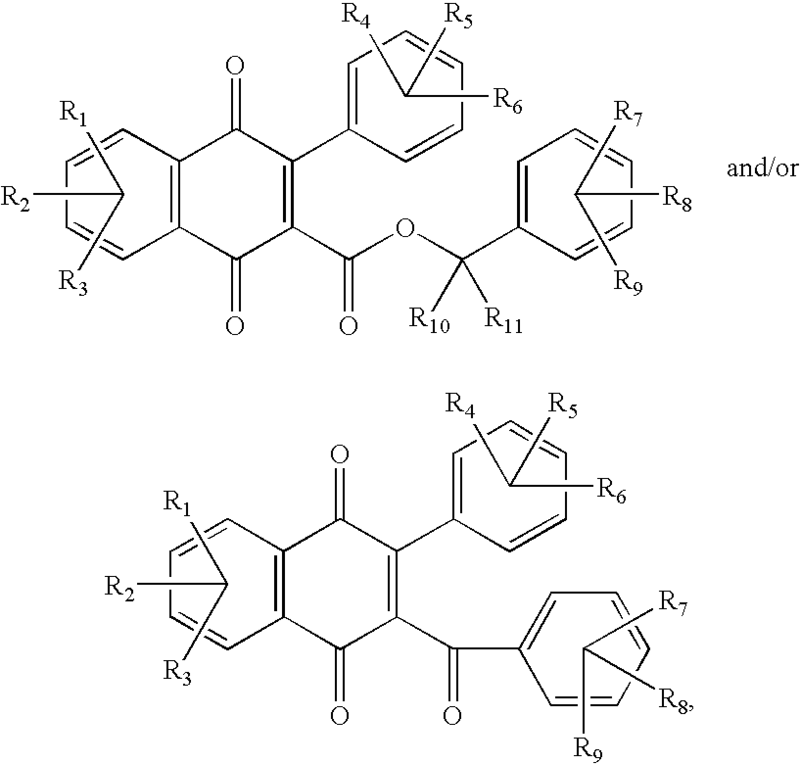 An imaging member in accordance with claim 1 wherein said electron transport component is 1,1′-dioxo-2-(4-methylphenyl)-6-phenyl-4-(dicayanomethylidene)thipyran. 20. An imaging member in accordance with claim 1 wherein said electron transport component is N,N′-bis(1,2-dimethylpropyl)-1,4,5,8 napthalenetetracarboxylic diimide. 21. An imaging member in accordance with claim 1 wherein said electron transport is N,N′-bis(1,2-dimethylpropyl)-1,4,5,8 napthalenetetracarboxylic diimide, and the charge transport is a hole transport of N,N′-diphenyl-N,N-bis(3-methyl phenyl)-1,1′-biphenyl-4,4″-diamine molecules. 22. A photoconductive imaging member comprised of a mixture containing a photogenerating component, hole transport molecules and an electron transport component, and thereover and in contact with said first layer a second layer comprised of hole transport molecules dispersed in a resin binder. and mixtures thereof, wherein each R is independently selected from the group consisting of hydrogen, alkyl having 1 to 40 carbon atoms, alkoxy having 1 to 40 carbon atoms, and a halogen. 24. 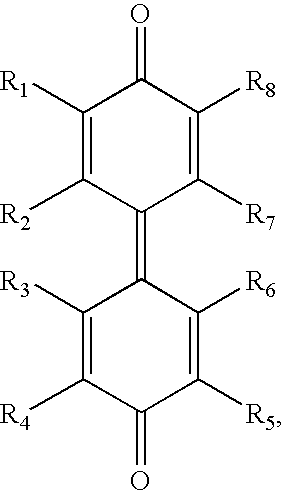 An imaging member in accordance with claim 23 wherein the arylamine is N,N′-diphenyl-N,N′-bis(3-methylphenyl)-[1,1′-biphenyl]-4,4′-diamine and the film forming binder is a polycarbonate. 26. A photoconductive imaging member comprised of a single layer comprised of a mixture of a photogenerator component, a charge transport component, an electron transport component, and a polymer binder, and wherein the photogenerating component is selected from the group consisting of a titanyl phthalocyanine poly(4,4′-diphenyl-1,1′cyclohexane carbonate and a perylene. 27. 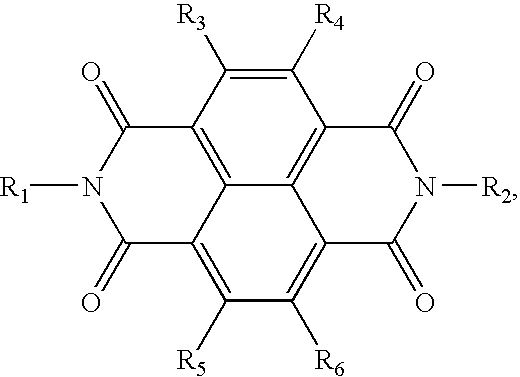 A photoconductive imaging member according to claim 26 wherein the perylene comprises poly(4,4′-diphenyl-1,1′cyclohexane carbonate.